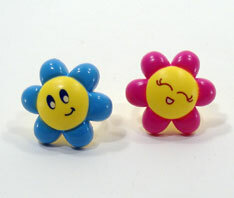 Cheerful and brightly colored flower rings. A great addition to a party favor bag! Plastic. 1 ¾ inch. Sold by the dozen. Bagged 1 dozen. $2.85 per dozen for 40 dozen or more. $2.45 per dozen for 80 dozen or more.